The first time I attempted to make cacio e pepe, I thought it had to be just about the easiest pasta dish to make, outside of the un-sauced spaghetti and butter that young kids without functioning taste buds demand. I mean, most of its ingredients are in its name: cacio is “cheese” in a number of Italian dialects and “pepe” is pepper. How hard could it be? The real question I should have been asking was “How easy is it to screw up?” And the answer to that is: Extremely. See, easy and quick aren’t necessarily the same thing. Start to finish, it’s about a 20-minute endeavor, which makes it a perfect weeknight meal. But you’ll end up crying yourself to sleep that evening if you’re not 100 percent in control of each one of those minutes. 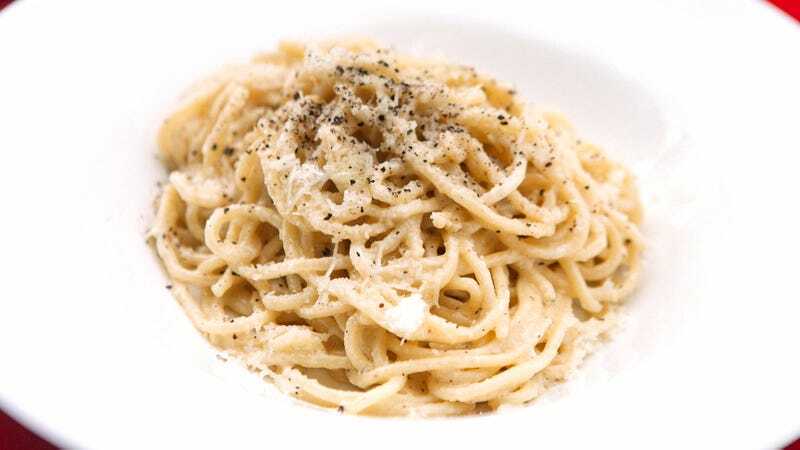 The first time I made cacio e pepe, I boiled and strained the pasta, dumped a bunch of grated Parmesan on it and stirred in a bunch of black pepper. It was a clumpy, unsightly mess with rather unremarkable flavor. To add insult to injury, I later traveled to Rome and ordered an authentic bowl of the stuff, which was the creamiest, tangiest version I’d ever had (maybe I was caught up in the Rome-ness of it all, too). The cheese formed a smooth, almost gooey sauce with absolutely no clumps. Somehow the pepper and Pecorino Romano melded into a single, glorious unit of deliciousness, one that made me depressed at my own ineptitude. When I returned home, I tried to make it a few more times, using a different Googled recipe for each attempt. The clumpiness remained and pepper flavor was, at best, uneven. But then I learned two simple techniques that changed my life (by “life” I mean “ability to make cacio e pepe,” which I consider interchangeable). First, the pepper. The mistake I had been making all along was sprinkling it on top of the finished pasta and then mixing it in. I should have been heating the freshly ground black pepper in some extra virgin olive oil (butter works too). Now, the cheese. It goes without saying that you shouldn’t cheap out in this department. Raymond Fiore, the owner of the Jersey City restaurant Roman Nose—which serves a mean cacio e pepe—is particularly passionate about this, as well. But it’s not just what kind of cheese you use, it’s how you combine it with the other elements. The critical component whose importance I previously had underestimated was the pasta water itself. I’d often reserved a cup or two of pasta water with various recipes before, but it wasn’t the right pasta water. For one thing, I’ve always been a bit too stingy with the amount I’d use. At most, I’d add a half-cup. I’ve learned that if you’re making a half-pound of pasta, you’ll need between one and 1 1/2 cups. The other problem I’d had in the past was that I was scooping the water out of the pot too early. You need to wait until you’re ready to dump the pasta in the colander before you take the water. That way, you’re ensuring the water’s maximum starchiness. It’s key to giving the cheese that rich, saucy consistency. And please, never use cream. It’s not authentic, and all it does is dilute the flavor of the Pecorino. If you want to use cream, you might as well go make fettucine alfredo. So without further ado, here’s the recipe I’ve developed after much, much trial and error. * Tonnarelli is the traditional noodle, but bucatini and very thick spaghetti are suitable substitutes and a bit easier to find. I’m not crazy about using linguine here—and definitely not angel hair. ** I’ve seen a number of recipes that call for a combination of Pecorino Romano and another hard cheese, like Parmagiano Reggiano or Grana Padano. Neither is necessary. This is a Roman dish and Pecorino Romano, the quintessentially Roman cheese, is the only one you’ll need. Grate the cheese and grind the pepper. Bring a large pot of water to a boil. Once it starts to boil, add a generous quantity of sea salt. I usually just shake the container a few times with the large spout open. But for measurement’s sake, five or six teaspoons is a good amount. Add the pasta to the boiling water. While the pasta is cooking, heat the oil (or butter) in a separate pan, one that’s large enough to eventually hold all of the ingredients, including the pasta. Pour the pepper in the hot oil and stir around for about a minute or two. When the pasta is about is a bit firmer than al dente (about two to three minutes before it would normally reach al dente”), scoop out one to 1 1/2 cups of the pasta water (the extra 1/2 cup is for fine tuning, if necessary). Strain the pasta and pour one cup of the hot pasta water into the pan with the oil and pepper. It should start boiling, or at least simmering, fairly quickly. Pour in the pasta. Stir around and add an additional 1/2 cup of pasta water (a little more if it seems too dry. Simmer the pasta for a total of about 2 minutes and then remove from heat. In the same pan, while still hot, dump in the grated Pecorino Romano, stir vigorously until you’ve achieved a creamy consistency. Divide and serve.